Precisely. In fact, the military historian should be less prone to glory in war than anyone but the soldier, since he knows what war is and what it can do. Those who accuse military historians of glorying in war are badly in error. You don’t study war because you like it; you study it because it’s important, instructive, and (by all indications) here to stay. Most folks remember Carroll (if at all) as the only Catholic among the Founding Fathers and the last surviving signer of the Declaration of Independence. Birzer raises some interesting points about Carroll’s religion and its impact on his reputation. Despite the strain of religious liberalism that a lot of people associate with the Revolution, many eighteenth-century Americans remained deeply suspicious of the Catholic Church. The fact that Carroll managed to become an influential leader of the Revolutionary movement in spite of this is pretty impressive. Hey, with this whole Gen. McChrystal flap, reckon there’s any chance all those pundits and columnists will break out the historical comparisons and contrasts? The Greensboro News & Record gives it to you short and sweet. The Kansas City Star, complete with slide show. From The Atlantic: “Obama Borrows the Military Back.” Get it? Get it?!? Politics Daily ranks the “Top 3 All-Time General-Against-President Feuds.” Guess what the top two are. No, go on. Guess. You know, what this scenario really needs is somebody to play Grant to McChrystal’s Young Napoleon. From ABC: “As one Marine told ABC News, ‘the softball is teed up for Petraeus to hit it out of the park. '” Ta-daa! NPR notes that “commanders must carefully negotiate the discrepancy between the enormous power they wield in the field and the deference they must show to their civilian superiors.” Then they offer up the Conway Cabal as an example, despite the fact that Washington was not Conway’s civilian superior. Bonus points, though, for invoking something besides McClellan and MacArthur. These are all from the first page of Google results I got, and it’s not even been twenty-four hours since McChrystal got called to the principal’s office. Going back to the subject of Mormon historical tourism, here’s a pretty extensive list of LDS historic sites in the U.S. Some are full-fledged, public history-type institutions, with the usual trappings: visitor centers, guided tours, restored buildings, exhibit areas, and so on. As far as I’ve been able to tell, this kind of extensive effort to preserve, restore, and interpret a chain of church-related historic sites all over the country is unique to Mormonism. Just about all of the major American denominations have archives and historical societies. But historic sites and museums operated under the aegis of a national church body are few and far between. Some of these churches have episcopal structures that could theoretically oversee this sort of thing, and even de-centralized groups like the Southern Baptist Convention have cooperative programs to fund education and missions, but it seems that no religious group is nearly as active in preservation and interpretation program as the Mormons. So why is the Church of Jesus Christ of Latter Day Saints devoting so much more effort to running historic sites than other religious groups? I can think of a few possible reasons. First, there’s a steady supply of enthusiastic volunteers to keep the sites going. As I noted in my review of the Illinois LDS sites, that church actually utilizes its missionaries to work at them. This is critical, because interpreters are the foot soldiers of large historic sites. With lots of young people and retired couples eager to serve eighteen-month or two-year stints as missionaries, and a church organization willing to post them at historic sites, the church has both the human resources and a framework in place to deploy them. Of course, evangelicals are keen on winning converts, too. The Southern Baptist Convention recruits, trains, and supports laypeople who serve on the domestic and international mission fields. They don’t, however, employ them as historic site interpreters. The fact that the LDS church does so says something about the importance of history to this religion. Third, and perhaps most importantly, Mormonism has embraced its own distinctiveness. The church has a long history of suffering persecution, misunderstanding, and exile, and this lends itself to historic consciousness. You’re more likely to hold onto your history if it’s a cornerstone of your identity. As I said in a previous post, visitation to Historic Nauvoo is 80% Mormon. This suggests that a lot of the people who go there want to be reminded of who they are and who they used to be, and why their deposit of faith is something significant. Still, since the church deploys its missionaries to places like Historic Nauvoo, it’s tempting to wonder whether or not historic tourism is an effective means of proselytizing. I don’t have any figures, so I don’t know the answer. I can say from my own recent experience that if it doesn’t win converts, it does at least win interested observers. I doubt I’ll ever become a Mormon, but since visiting Nauvoo and Carthage I’ve become fascinated with Mormonism’s origins as a subject of study—as an interesting historical phenomenon, in other words. That’s generally how it goes with historic sites. I can’t tell you how many Civil War buffs have told me that they owe their obsession to a battlefield visit. But you can’t use your history to generate interest if you don’t have a platform for doing so. All those church archives and historical societies operated by the bigger denominations are important enterprises, but it’s mostly researchers and history enthusiasts who will use them. Heritage tourism reaches a broader audience, even if it’s the already-converted who need to know more about their own spiritual heritage. If you don’t mind, I’d like to ask you a question which involves the teaching profession and one’s faith. This whole discussion about teaching history, polarization, perspective, etc, etc begs the question: Can history be taught in a vacuum? As you have indicated [in a comment left on Richard’s blog] that your consider yourself an evangelical Christian, I would have to assume you believe in the Providence of God and its implications regarding history. You are also aware of Scripture’s admonition to ‘do all to the Glory of God.’ So, as a historian, teacher, and Christian, how do you believe you should approach the teaching of history, particularly American history? This is not a ‘gotcha’ or ‘trick’ question or some sort of trap. I’m sincerely interested and curious of your thoughts and approach. If you’d prefer to answer privately, you may email me and any response would be kept confidential. I don’t mind at all, and in fact this might make for an interesting discussion deserving of its own post, so here goes. To answer Richard’s first question, do I think history can be taught in a vacuum? No, I don’t, but I also don’t believe that doing fair, balanced, impartial history is totally impossible. Any historian—any human being—is going to bring a lifetime’s worth of experience and opinions to anything they undertake, but a good historian tries to ensure that his investigations are aimed at extrapolating the truth out of the evidence and nothing more. My conviction is that the historian’s only goal in scholarship should be finding out the truth. History can and should be taken into account by decision-makers and citizens, since it provides the context for understanding human activity. But the historian’s task is primarily to provide the information, and then somebody else can take that information that only the historian can provide and then use their own distinct skills to apply it to some given situation in which variables come into play. That, in part, is my answer to the second question. How should I approach history, particularly American history, as a Christian? The same as anybody else. The purpose of scholarship remains the same. It’s to find the truth. The purpose of teaching remains the same. It’s to impart accurate information and enable understanding so that students can find the truth. The purpose of history is to discover and share the truth about the past, period. So does religious belief have any impact on what I believe to be that truth? Well, when it comes to specific matters of historical interpretation, when the rubber hits the road it really doesn’t matter that much. I don’t mean that I want to minimize faith; I mean that I don’t want to abuse it. Let me explain what I mean by that. 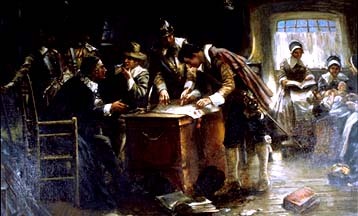 Edward P. Moran's depiction of the signing of the Mayflower Compact, from the Pilgrim Hall Museum via Wikimedia Commons. But being a Christian doesn’t automatically mean that I believe God causes all things to happen. There are some Christians who do in fact think so, and they would challenge me by asking whether I believe that God is sovereign. And I’d reply that I think God is every bit as sovereign as He wants to be. Part of that sovereignty means that He has allowed humankind the freedom to act on its own, and history is (among other things) the sum of the consequences. In other words, while God has a plan, I think He allows things to happen that don’t always conform to it. Some events have unfolded because people have acted according to His plans, others because they’ve acted in opposition to them, and still others because people have been going about their business in ignorance of or indifference to what God wants. In some of those cases, God comes in and gives portions of mankind a good, sound kick in the pants to get things back on track, or to correct people’s course, and that sort of thing occupies a good deal of the Old Testament. So when I study history, unless it’s biblical history, I don’t assume that God did or did not ordain something. I just try to figure out what happened and why based on the evidence in front of me. How, then, does my religion impact my work? It means that in my professional dealings with people I try to behave with as much integrity as I can, knowing that God values these people no less than He does me, and that they are eternal creatures just like me. It means I try to do the best work that I can, by finding the truth as conscientiously as possible. It means also that I try to remember that there are more important things than my professional life, or even than figuring out the truth about some given historical situation. Beyond that, I don’t worry about whether or not I can discern every single detail of God’s working over the course of human history. I think I know what sort of life He intended for man, both here and in the hereafter, and the means He’s put into place to get us there. That’s enough for me. One of the interesting things about online communication is the ease with which you can unwittingly offend people. In other words, just because you run across some incident about a liberal teacher or a conference organized by some radical group marketed to teachers, it doesn’t mean that it’s representative of the majority of American educators. Don’t take an anecdote or incident and generalize it to apply to teachers in general. Apparently Chris took this comment to mean that by “over-generalizing” I was referring to his characterization of the group, rather than with a tendency in the blogosphere to generalize about teachers. So for the record, let me state here and now that I’m not in favor of a radicalized classroom, and that I’m not challenging his description of the group’s aims. Then I stopped by Old Virginia Blog and found that Richard Williams is also upset with my use of the terms “anecdotal” and “over-generalization,” and seems to be under the impression that my comment referred specifically to him. He argues that radicalized education is, in fact, a pervasive problem. He also provides a few additional examples to prove his point, although I think generalizing from four anecdotes isn’t much more persuasive than generalizing from one. Since what I assumed to be a rather casual remark has upset some folks, let me take an opportunity to explain what I meant. “Anecdotal evidence” can have different meanings. It can mean evidence that is of dubious veracity, such as hearsay. Or it can mean evidence in the form of a related incident that, while true, is not of sufficient weight to prove a larger conclusion. I used the term “anecdotal” in this second sense, which as far as I know is the most common one. I never said that I don’t have a problem with politicization of the classroom. I do have a problem with it. Furthermore, I never said, to quote Richard, that “there is no real evidence this is occurring in our schools.” One can certainly find instances in which the classroom has become politicized. What I said is that we shouldn’t assume that these incidents accurately convey the beliefs or teaching approaches of most American teachers. It would be like finding some accounts of Revolutionary War soldiers who broke into houses while foraging and murdered the occupants and then arguing that the Continental Army was plagued with murderers in the ranks. The evidence is too narrow to support such a broad conclusion. You can no more extrapolate an accurate picture of American teaching from this sort of thing than you can understand American Christianity by looking at the nuts from Westboro Baptist or a bunch of abortion clinic bombers. Most teachers just aren’t leftist kooks, and they don’t necessarily share the opinions of every organization that claims to speak for them, even when it’s the nation’s largest teachers’ union. I’ve explained why I believe all this to be the case in an earlier post, to which I humbly re-direct everyone’s attention. So I don’t deny that attempts to politicize the classroom exist, or that Chris has accurately described one. I just don’t think it’s representative of what most teachers are doing. What I’m suggesting is that we don’t decry the state of the American classroom every time we run across some story about a left-wing organization acting up. That’s not so bad, is it? Public history fascinates me. I love visiting and thinking about historic sites and museums, and one of my favorite things about this blog is the opportunity to talk about it. Since I went to some interesting places over the past week, I’ve been itching to do a post about them. Still, as I said last time, it’s taken me a while to get this stuff down in final form. In many years of visiting, studying, and working at historic sites and museums, this batch has presented a unique challenge. The thing is, these sites are operated by religious organizations, and they handle the interpretation from their own distinct perspectives. Because of that, analyzing the content of their programs and exhibits is a somewhat delicate undertaking. I want to assess them honestly while taking their unique circumstances into account, and I certainly don’t want to give offense to anybody. I’ve written and re-written this post countless times over the past several days in an attempt to juggle all these concerns. I hope I’ve succeeded. When I review a museum or historic site here, I usually handle each one individually. This time I’m going to discuss three historic sites in one post. They all deal with the same subject matter, they’re all located near one another (two of them are actually side by side), and they incorporate religion into their interpretation in two different ways that merit comparison. The first and largest is Historic Nauvoo, a kind of Midwest Williamsburg operated by the Church of Jesus Christ of Latter Day Saints. Few places are as important to the history of Mormonism as this town beside the Mississippi River. Following their expulsion from Missouri in 1838, the Mormons purchased land in western Illinois and began construction of a city that grew so fast it rivaled Chicago. Securing a charter that granted them a great deal of latitude in establishing a town government, they also organized their own militia unit, published their own newspapers, and constructed a magnificent temple on a bluff overlooking the city. Historic Nauvoo is a recreation and restoration of parts of the town as it appeared during the Mormons’ residence there. That residence was brief. Outsiders were suspicious of Joseph Smith’s power (he was not only head of the church but also the town’s mayor and commander of its militia), and they feared the Mormons’ rapid growth, political influence, and economic prosperity. Furthermore, dissenters within the faith criticized Smith’s leadership. In 1844, one of these dissenting factions published a newspaper with allegations about the prophet’s behavior and intentions, promising more revelations in subsequent issues. Smith and the city council ordered the destruction of the press, which led to the prophet’s imprisonment in nearby Carthage. After a mob murdered Smith and his brother in jail, the Mormons hastened to complete the Nauvoo temple, but ultimately abandoned their city when it became apparent that coexisting with the surrounding populace would be impossible. Many migrated to Utah under Brigham Young’s leadership. Historic Nauvoo’s visitor center has an exhibit on the construction of the town, the everyday life of its inhabitants, and their eventual departure. The galleries also house a few works of religious art, including some pretty impressive paintings and sculptures. Two theaters provide a venue for orientation films. The rest of the site consists of restored and reconstructed buildings which are open for guided tours: a general store, the newspaper office, Cultural Hall, the tinsmith shop, the homes of prominent Nauvoo citizens such as Brigham Young and Joseph Smith’s mother, and so on. 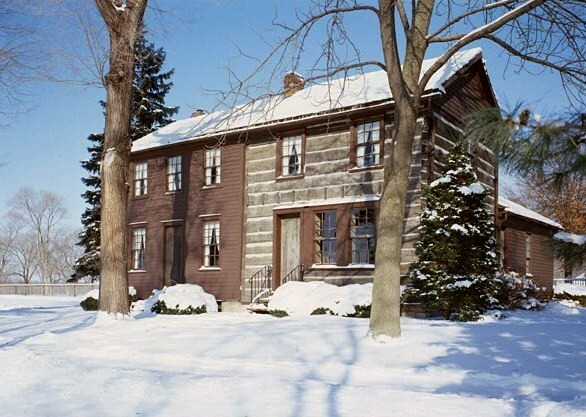 Nauvoo’s other museum is Joseph Smith Historic Site, with its own visitor center, two homes the prophet and his family inhabited, a reconstruction of his brick store, a boarding house, and his grave. The Community of Christ, a separate Mormon denomination that formed under the leadership of the prophet’s son, manages JSHS. This site and Historic Nauvoo are only about half a mile apart, and you can easily walk back and forth between them. I suspect that many non-Mormon visitors (who comprise about 20% of the traffic) simply assume that it’s all one big operation, rather than two sites run by different churches. The visitor center at JSHS has an orientation film, too, as well as a small exhibit area. Unlike the LDS facility, it also offers a gift shop with a pretty impressive selection of books, art, and other material. The third site, Carthage Jail and Visitors’ Center, is located about twenty miles away. Like Historic Nauvoo, it’s run by the Church of Jesus Christ of Latter Day Saints. The main attraction here is the building where Smith, his brother, and two companions were imprisoned after the attack on the newspaper. On June 27, 1844 a mob stormed the building and made its way upstairs to the bedroom where the men were staying. Hyrum Smith, trying to block the intruders from breaking through the door, took a bullet in the face and died; the door is still there, and so is the bullet hole. Joseph Smith, shot multiple times, plummeted through the second-story window and died outside. One of the other men was wounded. There’s a visitor center here, too, but no exhibits other than a series of paintings. It’s mainly a staging area for the tour and a small orientation theater with a film. In fact, this building reminded me of nothing so much as a funeral home—elegant furnishings, music coming from a piano in the adjacent room, and a somber but friendly gentleman in a dark suit standing near the entrance. Under normal circumstances, that would be that. But, of course, these aren’t exactly normal circumstances, because there’s a sense in which these are sacred sites, and the tours, exhibits, programs, and films are all church operations. The question is whether or not that makes any difference. Well, that’s a complicated matter, and it’s the reason I’ve had so much trouble figuring out how to review my visit. The short answer is that JSHS is a pretty straightforward affair, but at the two LDS sites, you’re going to get more than a little religion mixed in with your historical tourism. I had actually assumed it would be the other way around, since the prophet himself is buried on the grounds of JSHS. (His final resting place is surprisingly humble, by the way, and is actually his third grave, since his wife had him interred two times secretly before his remains were moved for the last time.) But for the most part, it was your standard historic site tour, and a superb one at that. The only nod to religion was a segment at the end of the orientation film which gave a brief overview of the Community of Christ’s ministries. At Historic Nauvoo and Carthage Jail, religion is more front-and-center, and sometimes historical interpretation gives way to apologetics. Sometimes it was a case of things left unsaid. Conspicuously absent from the exhibit and the films, for example, was any mention of why Smith ended up imprisoned at Carthage to begin with, or any substantial discussion of the dissension within the community that plagued the prophet and the other leaders. I’m not saying that the site is duty-bound to pore over every unsavory incident that happened during the town’s history, but I do find it unfortunate that Smith’s death is stripped of any immediate context. This makes his murder and the eventual collapse of Mormon Nauvoo harder to understand—and enabling visitors to understand is what museums and historic sites are supposed to do. That’s not to say that the exhibits are just a whitewash job, or that they aren’t informative. That’s not the case. The display at Nauvoo’s VC does lay out a basic history of the town and its inhabitants. Nevertheless, there are some parts of the story that are missing. Furthermore, I was neither surprised nor offended to see LDS literature available in the visitor centers at Historic Nauvoo and Carthage’s jail. They are, after all, the church’s sites, and it’s both natural and perfectly proper that they should have this information available for those who are interested. What did surprise me was the extent to which the guides would weave religious outreach into their building tours. The interpreters at Historic Nauvoo and Carthage are, in fact, missionaries, who come from Mormon congregations all over the country to work for eighteen-month postings. Every single one of them was incredibly polite, warm, and knowledgeable, without any exceptions whatsoever. (I’d also add that the other visitors were noticeably friendlier than the tourists you run into at most other places.) I’ve never felt so welcome at a site or museum, although they were much more interested in my religious affiliation than interpreters at, say, Old Salem or Plimoth Plantation. My most notable encounter happened at Nauvoo’s newspaper office, where the guide was a bright, attractive, and knowledgeable young lady in period dress. After demonstrating the operation of a nineteenth-century printing press, she noted the importance of being able to read the truth, stated repeatedly that she believed the Book of Mormon to be true, and then (with an earnestness that I’m not accustomed to receiving from attractive young women, whether at historic sites or in any other circumstances) asked me if I would read it. A little taken aback at the way this tour had turned out, and always a sucker for a pretty face in 1800’s clothing, I told her that I would. That was only the second building I’d visited that day, so I wondered if that sort of thing was going to be the norm. It wasn’t. I visited most of the other buildings with groups or families, and in those cases the guides would usually just end with some anecdote or quote from the person who lived or worked there, with a brief admonition to emulate their faithfulness. A couple of days after visiting Nauvoo I drove up to Carthage to see the jail. Stepping into the visitor center, I met the guide, who was the kind, older gentleman in a suit I mentioned earlier. While I was waiting for the next tour to start, I picked up a copy of the Book of Mormon sitting on a table and thumbed through it. “Are you a member of our faith?” he asked me. Thinking it would be rude to turn him down, I thanked him and took it with me. I had, after all, promised the girl at the newspaper office that I’d read it, so I was kind of obligated. I found out that this gentleman had worked at Nauvoo for a while, but this was only the second time he’d been assigned to give tours of the Carthage jail. His talk was extremely informative and well-prepared, as if he’d been working there every day for years. 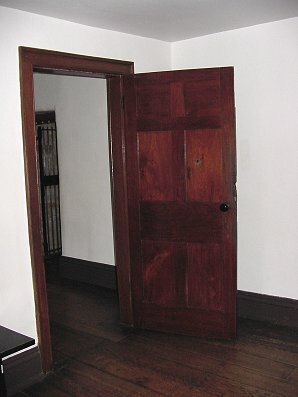 Hyrum Smith died while trying to keep the mob from breaking through this door. The bullet hole is visible in this photo from Wikimedia Commons. When we entered the second-story bedroom where the mob broke in on the Smith brothers and their companions, the other visitors and I sat on benches while he related how it happened. It was, understandably, a difficult story for him to tell. “Excuse me,” he said at one point, “I get a little emotional here.” As I sat there looking at the bullet hole punched clean through the door, I figured that if I were in his shoes I’d probably be a little emotional myself. I hope I’m not giving you the impression that if you visit these sites you’re going to get hit with an endless barrage of proselytizing. That wasn’t the case. Anyway, I don’t get offended when people share their faith with me. I’ve got religious beliefs, too, and my opinion is that sharing something so personal with a total stranger takes guts and not a little love for your fellow human beings. What I found odd wasn’t what they were doing, but the setting in which it took place. There’s just no smooth way to transition from historical instruction to missionary outreach within the brief amount of time allotted to a building tour at a large site like this. It’s unavoidably jarring, like one of the don’t-play-with-matches PSA’s awkwardly tacked onto the end of the cartoons I used to watch as a kid. The approach at the Joseph Smith Historic Site’s VC is much more sensible and, I think, effective. Let the orientation film briefly let visitors know who you are and what you believe, and then let the history do the talking. That history speaks eloquently enough on its own. The early period of Mormonism is one of the great American stories. It’s an unfortunate paradox that this religion, born so recently and on our own soil, should be one of the nation’s least understood faiths. These sites can remove some of the mystery by providing the historical context that’s so necessary to understanding any part of the human experience. I would recommend that the managers of these sites be less concerned about making openings to share their faith. The history is so compelling, the personnel so warm and engaging, that many visitors will probably open up on their own. “This is the most beautiful place and the best people under the heavens,” Smith supposedly said as he rode out of Nauvoo for the last time on his way to prison and martyrdom, and anybody visiting today would be hard pressed to disagree.